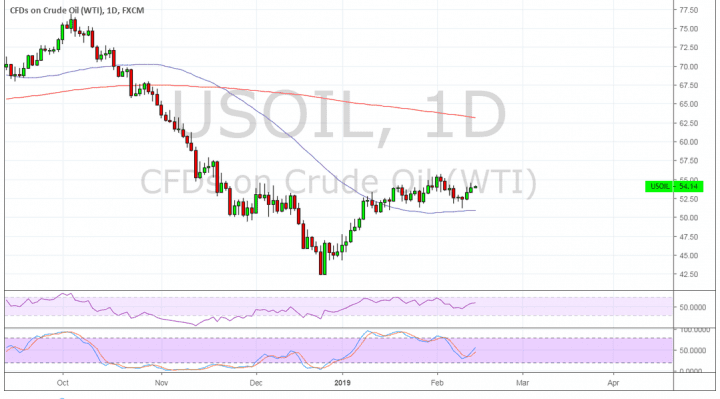 WTI crude oil looks ready to complete its inverse head and shoulders pattern as it bounced close to the 100 SMA dynamic support. Price has yet to test the neckline around the $55 per barrel mark and break higher to confirm that a reversal will follow. This chart pattern spans $42.50 per barrel to $55 per barrel so the resulting uptrend could be of the same height. However, the 100 SMA is still below the longer-term 200 SMA to indicate that the path of least resistance is to the downside. In other words, the downtrend is more likely to resume than to reverse. RSI is still turning higher and making another climb to the overbought zone, indicating that buyers could stay in control. Stochastic is also turning higher to indicate that buyers are returning without even seeing oversold conditions. Price is above the 100 SMA dynamic inflection point as an early indicator of bullish pressure. This moving average could keep holding as support from here. Goldman Sachs predicts that crude oil could reach $67.50 per barrel in the second quarter of the year on account of significant OPEC output cuts. To top it off, US sanctions on Venezuela are in place and could further weigh on global supply. “Producers are adopting a ‘shock and awe’ strategy and exceeding their cut commitment. The production losses to start 2019 are already larger than we expected,” Goldman says, noting that more disruptions could be coming, due to the U.S. sanctions on Venezuela’s oil industry. Earlier in the week the API reported a surprise draw in stockpiles versus the estimated buildup, indicating that supply is weakening in the US as well.